Over the last few decades, modern medicine has made groundbreaking advances in the treatment of illness, particularly cancer. Now, lives are saved, prolonged and improved due to the treatments discovered and utilized in the field of oncology. Along with this improvement, comes the need to maintain and improve the quality of the lives being saved. Across the country, it has become increasingly common for integrative medicine to step into this role. As patients work with psychologists, social workers, massage therapists, healing touch practitioners, acupuncturists, and mind-body practitioners, there is an ongoing collaboration to bring about the full spectrum of health for patients. It is well accepted that exercise and stretching are beneficial during cancer treatment to maintain range of motion and flexibility. Physically, yoga practice is joint loosening and strength building. But yoga is also a mind-body practice. This means that in yoga there is an understanding that the patient is more than a mechanical body, and the goal is to work to cultivate a harmony between both the mind and the body. Yoga is also the skill to calm the mind. When the mind is calm, students can practice acceptance of what is happening right now. It teaches the student to witness the present moment without needing to change it or react to it. Cultivating this demeanor helps patients, caregivers, and their families to cope with the stress of diagnosis, treatment, and side effects. In yoga philosophy stress is equivalent to speed, so one of the primary practices is to reduce speed at all levels. Yoga classes, particularly in a medical setting, are designed to slow down both the body and mind, in order to promote stress reduction. As interest in yoga grows, many major medical centers across the country have been engaged in ongoing research about the benefits of yoga. 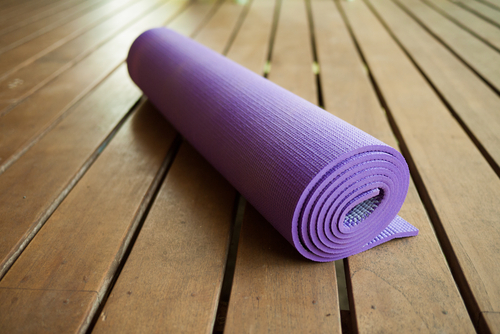 MD Anderson Cancer Center in Texas is at the forefront of research in mind-body practices (particularly yoga) for cancer patients and cancer care. MD Anderson published a study this year in the Journal of Clinical Oncology of yoga for women with breast cancer undergoing radiotherapy. They found that yoga tends to ‘buffer’ the effects of cancer treatment. The results showed that the yoga group had an increase in physical functioning, general health improvement, and a decrease in fatigue they experienced a reduction in cortisol (a stress hormone), which is predictive of survival. And, interestingly, they found among their three study groups that the frequency of yoga practice had a statistically significant impact on the benefits of yoga to the patient, and that the more students practiced, the more they benefited. Yoga is one of the techniques that uses mind capacity to affect bodily functions and symptoms. At The Center for Integrative Medicine, we offer an ongoing restorative yoga class that is open to everyone, including cancer patients. In addition, in November, we will be offering a four-week yoga course specifically for those affected by cancer. Yoga is one of the many tools available to patients, so that they can take the life-saving benefits of medicine and turn the absence of illness into the presence of health.